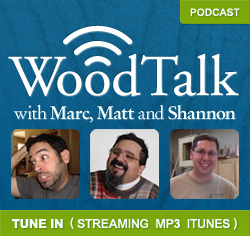 The latest episode of Wood Talk is up and posted at it’s new home. If you haven’t heard the news yet, Wood Talk with Marc, Shannon and myself is now a weekly show and will be posted at one central location so you always know where to find it. Follow this link Wood Talk No. 106 to find the shownotes, listen to the show and follow links to visit our first sponsor Microjig!. We also have a Facebook page just for the show too, head over there and “like us” when you get a chance! Middle of the Week News! !